Dawson Co. welcomed the Spartans of West Hall to the home of the Tigers on Wednesday for game two of a non-region series. Normally putting eight runs on the scoreboard is enough for a team to get the win but unfortunately not for the Tigers. The Tigers scored eight runs on fourteen hits and 3 walks in the game falling short by a mercy rule decision to the West Hall Spartans. Making it happen at the plate for the Tigers with a multiple hit day were Nathan Sorrels(3-4), Hudson Sapp(2-3 with 2 RBI’s and a walk), Palmer Sapp(2-2 with 1 RBI and 2 runs scored), T.J. Allen(2-4 with 1 RBI). Bo Lewis and Connor Bearden each added one hit a piece for the Tiger Offense. Defensively, the Tigers played very well committing only two errors on the day. The Spartan bats couldn’t be stopped. They opened up a case of hits containing twenty-one and scored eighteen runs in the six inning game. 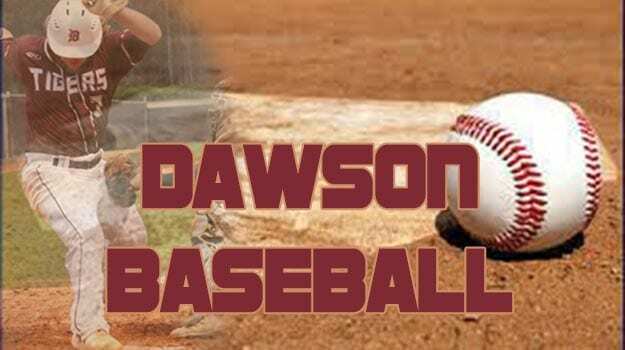 The Spartan scoring consisted of 4(1st), 1(2nd), 5(3rd),2(4th) and 6(6th) giving them the GHSA mercy rule victory over the Tigers of Dawson. The Tigers will take to the diamond on Monday starting at 5:55 pm as the welcome the Vikings of East Hall to Tiger Field at Dawson Co. High School.